Project updates: Hoop! Machine That Breaks Things! this weekend saw significant progress on a recent project, and a decent amount of progress on an ongoing one. The recent project is a hoop trapeze, aka lyra, aka circeaux. It's not an apparatus that i expect to ever be any good at, as it seems to be made for much more bendy folk than I. But we have a few of those made-of-string folk at our aerials practice group, some of whom have expressed interest in hoop, and i'd like to play around with it as well. At some point i had planned to send mail off to Jackie Tan and see if she had any hoops in stock. but then a couple of weeks ago that rolling cheap tools outfit Cummins showed up nearby for a day. They are a company that sends trucks full of cheap Chinese tools (think Harbor Freight) around the country for one-day stops at hotel ballrooms, and hawk their wares. Most of what they sell is total garbage. Dont even think of buying power tools there, or anything you need to be sharp, or precise. But if what you want is a cheap set of welding clamps, or a hydraulic jack, or whatnot, you can outfit yourself with something that will do the job but doesn't look very pretty. 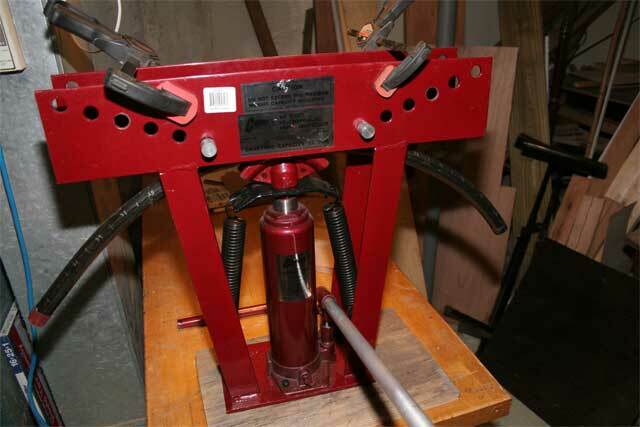 Such as this hydraulic pipe bender. 12 tons of bendy goodness; came with dies for up to to 2 inch pipe. I looked at that, and it's $99 price tag, and decided to purchase it, and build my own hoop. For this first one, i used plain old 3/4 I.D. black pipe from the plumbing dept of Home Despot. It's generic mild steel, with a nominal wall thickness of .113. Thats plenty good enough, strength wise, for a 36 inch diameter circle. The pipe bender works by using the built-in hydraulic jack to push the pipe against 2 fixed pinions, using curved dies to avoid crushing the pipe walls. Unlike a ring roller, it is not a continuous feed device. You have to bend a bit, back off, change position, bend a bit, etc. To get a nice consistent bend, and have it come out to the size i wanted, i'd need a few more tools. These are inside and outside radius guages. I made them out of plywood, with a jigsaw. Once i had two pipes bent, i cut off the ends with a pipe cutter, and welded them together with the TIG. This is where i decided to not use black pipe for the next one. It's a bloody PITA to remove all of the protective coating from the pipe, and if you leave any behind, it boils off in your weld pool and you don't get good welds. Hey! I've got a circle! So at this point the hoop is essentially done. The only question is, would i actually trust it? That's where the other project i've been working on comes in. It's "The Machine That Breaks Things". Or, more specifically. a tensile stress testing machine. Essentially, it is a beefy frame, with a couple of hydraulic jacks and cables, that can pull on something REALLY hard. In addition, an S-beam load cell sensor and indicator displays the precise amount of tensile force in the system. Here's a picture of it, in it's current incarnation. Standing to the left of it is the cnc plasma table, which cut out the tabs. I took each test piece and tested them up to 2000 lbs. Given that we will rig the hoop off of a loop of dynamic climbing rope, thats well over 8X the maximum force we ever expect to generate on the hoop (which has 2 tabs). No signs of fatigue or deformation after repeated cycling. So yes, i'll trust it.